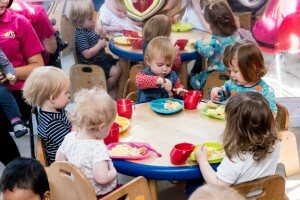 Meal times should be a happy and social occasion for both the children and staff. The menus are rotated on a 4 week basis and are changed for the Summer and Winter. All meals are freshly prepared on-site by our qualified chef Jason. 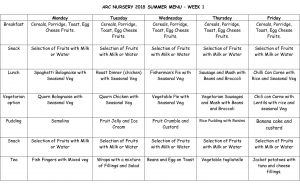 We have researched our menus to make sure they are balanced and nutritious, in line with the Food standard agency, the National Day Nursery Association, Ofsted Guidance and the Caroline Walker Association. Provide a balanced and healthy breakfast, lunch, tea and two daily snacks which include a platter of fruit, breadsticks and oatcakes. The children are given the choice of having milk or water to drink. Follow the children’s dietary needs. These are recorded and put up in the room so they are visible for the staff to see. Sit with the children at the table at mealtimes and will eat with the children to be good role models. Staff prompt children in exhibiting good manners at the table, encouraging them to say “please” and “thank you”. Encourage the children to make their own choices by serving up their own lunch, feeding themselves and pouring their own drinks. Encourage children to be social with their friends and carers at the table. Encourage children who refuse to eat their meals. Give more time for children who are slow eaters to eat their meals – they will not be rushed. Take portion sizes into account regarding each individual child’s needs. Provide access to fresh drinking water for all of the children throughout the course of the day. Robert & Leah WattParents, Arc Nursery.